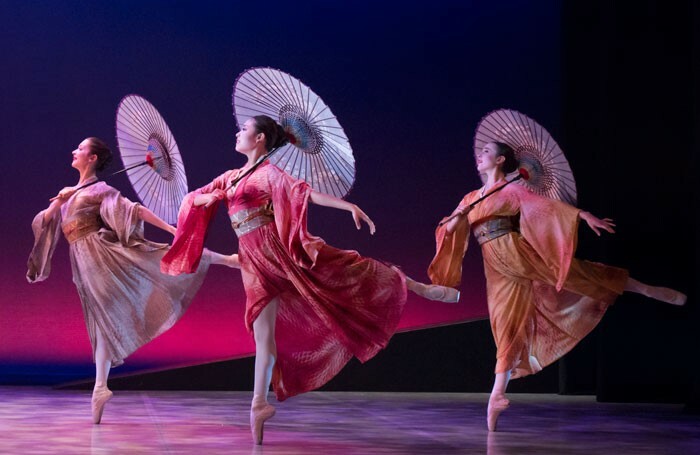 Northern Ballet’s current tour of Madame Butterfly – artistic director David Nixon’s early ballet for the troupe made in 2002 – confirms the company’s long-time strength, which is popular dance-dramas that are clearly choreographed with direct connection to the story. The sorry tale of the Geisha Butterfly who falls for the American naval officer Pinkerton only to be betrayed, is told with focused brevity, a merit reinforced by the precise and spare designs. Northern Ballet is a touring troupe, meaning big-scale props are not an option. Instead, time and place must be evoked with pack-in-a-bag sets and costumes, something this Butterfly achieves very prettily. John Longstaff’s orchestration of Puccini’s familiar score is similarly focused, and brightly played by the compact Northern Ballet Sinfonia. This clarity and immediacy makes Butterfly a good ballet for old and young alike, although the suicide of Butterfly – her only honourable option in Japanese culture – may be upsetting for youngsters in the audience. On press night, Pippa Moore and the guesting Kelley McKinlay took the lead roles of Butterfly and Pinkerton. Both dance with conviction and commitment. Kevin Poeung and Sean Bates stand out as Pinkerton’s friends, as does Ashley Dixon as the American Consul. While dance-dramas are the staple of Northern Ballet’s repertory, it has recently started performing plotless ballets including Perpetuum Motion by Christopher Hampson (currently artistic director of Scottish Ballet). Made for English National Ballet more than 15 years ago, the piece sits well on the company, although it is let down by harsh lighting that gives an unprofessional aspect to the production.